"Who's buying rights for the end of the world?" When you have watched enough movies, you develop some sort of viewer ESP, and you begin to notice little tell-tale signs that indicate potential danger ahead. Extreme Limits is full of red flags. For starters, you know you're in trouble when the DVD case doesn't even describe the plot accurately. The case talks about a "highly secure shipment of the world's deadliest explosives", when actually it is some type of mind-controlled death ray. Combine that with the deadly triple play combination of the film having been released somewhere under another name (Crash Point Zero), a director that goes by an assortment of names, and the inclusion of pivotal scenes 'borrowed' from three other films, then you traditionally have the makings of a painful viewing experience. Director Jim Wynorski, here billed as Jay Andrews, is a low budget action machine. 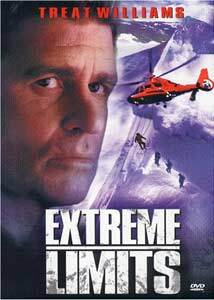 Extreme Limits, shot over a 14 day period, is another in an endless string of cheapie action flicks that will never be in the Die Hard league, but have titles that make you THINK it's a big budget noisemaker. Titles like Desert Thunder, Final Voyage, and Hard Bounty. Wynorksi isn't afraid to wave the low budget flag, and a handful of pivotal scenes in Extreme Limits come from three other films (Narrow Margin, Cliffhanger, and The Long Kiss Goodnight). Not hommages, mind you. Wynorski uses the actual footage. Talk about economical filmmaking. Extreme Limits concerns the discovery of the aforementioned death ray, allegedly created by Nickolai Tesla, by Dr. Hunter (John Beck) and his lovely daughter Nadia (Julie St. Claire) somewhere in modern day Siberia. The death ray, which uses mind control to direct some type of energy beam, is a highly coveted item, and the CIA is very concerned about the safe arrival of the unconventional weapon to the United States. However, during an attempted airborne theft of the death ray by a team of mercenaries, Hunter's chartered plane crashes in the remote Canadian wilderness. If you've seen Cliffhanger, you seen this already because Wynorski uses the same footage, intercut with the actors from Extreme Limits. Of course the plane is full of one-dimensional B-movie stock characters (the pill popping model, the diabetic dad, the airhead TV show host, the villainous pilot, among others) who serve no real purpose when all is said and done. The rest of the film balances three storylines awkwardly: one concerns a CIA Agent (Treat Williams) and his attempts to locate the weapon before the bad guys, another follows a few of the survivors attempting to make their way to civilization, and yet another that tracks the rest of the cast back at the crash site, huddled in the darkness of the wrecked fuselage while a huge bear lurks outside. The interesting thing about Extreme Limits is how Wynorski, unconcerned as he is about pilfering existing footage, is still able to put together a cheapo "B" action movie that knows it's not in the big budget arena, and make the most of the 90-minute run time. This is like a high school production of an action movie, and the lack of budget is obvious, as the borrowed scenes would obviously indicate. Wynorski, in his defense, directs Extreme Budget with all the speed, style and grace available to a low budget filmmaker, and the holes in the final product are to be expected. Some of the acting is—not surprisingly—laughable, which is on par with this caliber of film. I wasn't expecting Hamlet, and I wasn't disappointed. Treat Williams delivers an endless stream of one-liners, and John Beck and Susan Blakely contribute somewhat decent performances. Julie St. Claire, while maybe not a world-class thespian, is gorgeous, so there's one for the much needed Extreme Limits plus column. Image Transfer Review: Overall, a fairly decent 1.85:1 anamorphic transfer, but nothing to drool over. The glaring flaws are the jarring inclusion of some grainy stock footage, as well as the scenes lifted from other films having slight grain issues. The actual footage shot by Wynorski looks pretty good, with consistent flesh tones throughout. Black levels remain solid and have good depth, with the exception of the aforementioned borrowed footage. For a cheapo production, the image transfer is better than would be expected. Audio Transfer Review: Fox has wisely included an English 5.1 mix, which certainly makes this less than perfect film a bit more bearable. While not a system demo disc by any means, the rear channel activity is primarily reserved for music cues and sporadic gunfire. The 5.1 mix makes Neil Acree's score sound richer than a film of this breed should have. Dialogue is alway clear and audible, and is never overwhelmed by the score. An English 2.0 track is also included. Extras Review: Before I get to the good stuff, let me get the less than exciting extras info out of the way. The fullframe trailer makes the film look much better than it is, a photo gallery of 17 shots from the film is uneventful, and the cast/crew bios use such small type that it would only be legible on a screen 60" or bigger. The good stuff is the commentary track by Wynorski, actress Julie St. Claire and cinematographer Andrea Rossotto. It's almost a Mystery Science Theater-ish track, with lots of wisecracks and self-deprecating humor. The anecdote about how Wynorski secured the use of the footage from Cliffhanger is hilarious, as are his recollections about working with a bear. This commentary track is funny, and presents the low budget tackiness of Extreme Limits in a new light. As a reviewer, it's difficult to endorse a film that borrows so liberally and literally from other films. Yet even with it's flaws, Extreme Limits never overshoots it's original intention, which is that of an B-move action cheapie that might fool some casual renter into taking a risk. The Vertical Limit/Cliffhanger-ish DVD cover is proof of that. As a film, on it's own merits, I can't wholeheartedly recommend Extreme Limits. However, the laugh-packed commentary track by director Jim Wynorski, actress Julie St. Claire and cinematographer Andrea Rossotto is terrific, and in addition to poking fun at the film, provides the viewer with a humorous look into the making of a low budget production. This was a very pleasant surprise. If you are a fan of action films, I recommend you lower your expectations and rent Extreme Limits, especially based on it's unusually high MSRP. Have a beer, watch the film, then enjoy the commentary. It's a perfect compliment to a forgettable tale.